In the past 120 years, since the year 1892, the University of Illinois' men's football team played over 1,200 games of football. 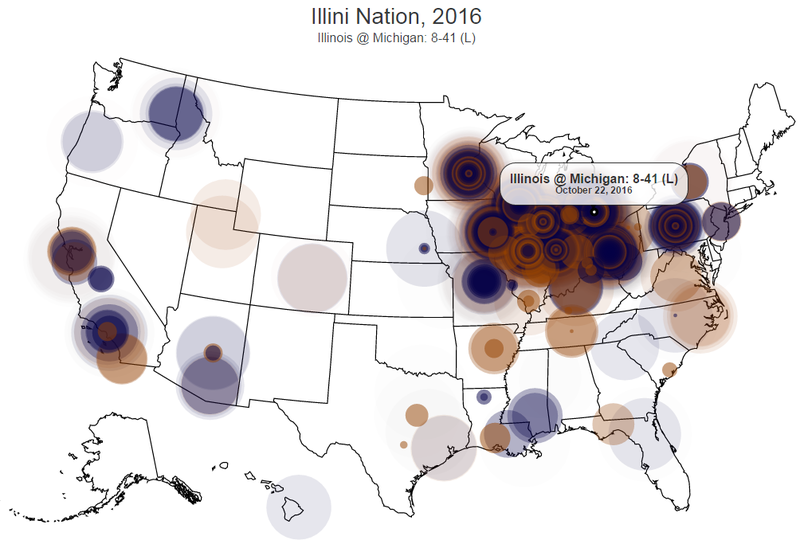 As part of CS 205: Data Driven Discovery, a project-based data science course open to all non-CS majors, groups of students analyzed a dataset that consists of every football game played by the Illini since 1892. This page is the result of one group's work. A circle is started for every Illini game, centered on the opponent's city. As years pass, circles dissipate with time. Scroll the page to advance through Illini games, tap/hover/click for game details. Love it? Share this and then build your own! Build this: If you are a student at The University of Illinois, join us in Data Driven Discovery to make something just like this! If you are familiar with computation know and understand how to use a conditional, loop, array/list, and a dictionary/object (in any language! ), you have the prerequisite knowledge to sign up for CS 205! In Spring 2017, CS 205 is offered as CS 199, Section 205, T/R 11:00am - 12:15pm, CRN: 61831. If you're not yet familiar with computation, learning how to program a computer is one of the most amazing things you can do at college! We offer CS 101 [course website, course catalog], CS 105 [course website, course catalog], and CS 125 [course website, course catalog], all of which will give you the prerequisite knowledge for CS 205!